Acne check peel is a chemical peel solution based on black vinegar. It is innovative and relatively safe chemical peel which is used for oily skin with acne & blemishes . 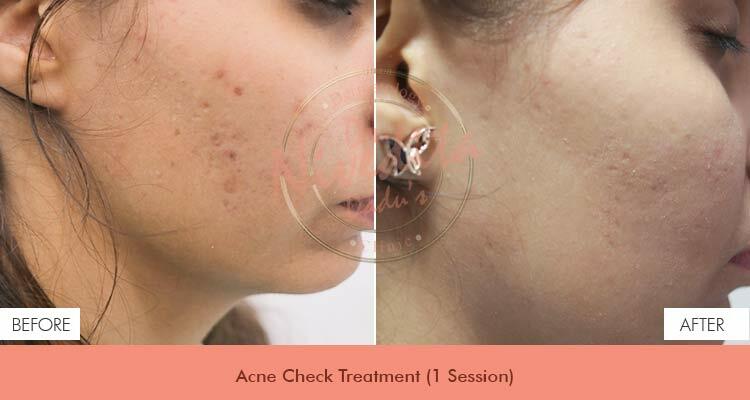 For the treatment after cleansing of skin comedone removal and extraction of acne is done after which the first single coat of acne check peel is applied. Patient may experience slight stinging sensation which will subside after a few minutes and after 3 minutes if no frosting is visible then a second coat may be applied which is again kept for 3 minutes after which the skin is cleaned with wet tissue. The downtime of this peel includes slight hyper pigmentation for next 4-5 days which will subside on its own and no visible peeling may be seen . Acne check peel is used for most difficult acne and has proven to work very effectively.